Monday, 18 March 2019, 7:41p.m. 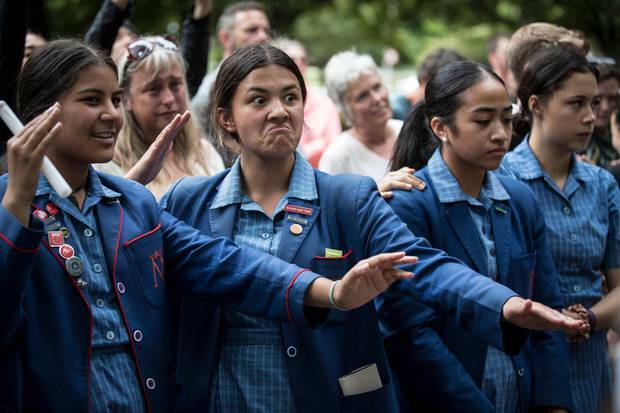 Stirring haka and tearful waiata lit up a corner of Hagley Park in Christchurch this afternoon to celebrate love and unity in the face of Friday's terror attack. Thousands of secondary school students from all over the city congregated in the park for the vigil, led by Cashmere High School head boy ‎Okirano Tilaia‎. Two Cashmere High School students were killed in Friday's shootings, as were the father of a student and a former student. Another student and the father of a student were also injured. 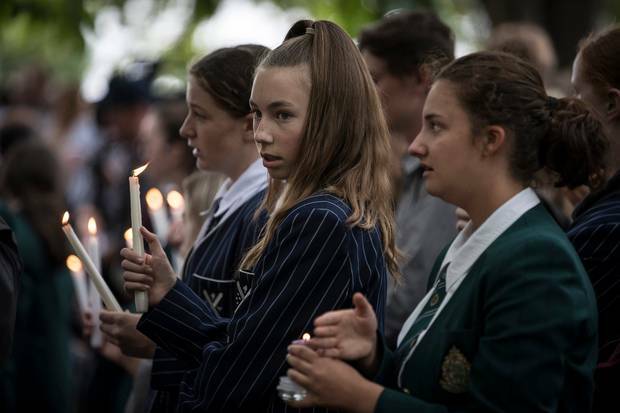 At the vigil, Year 11 student Jarrod Gali from St Thomas of Canterbury College paid tribute to the Muslim man who greeted Friday's gunman with the welcoming and peaceful words "hello brother", before being gunned down. St Margaret's College head girl Sujean In brought hundreds of paper chains to the event to decorate the park's fence. The movement to make the paper chains, decorated in bright colours and carrying messages of support, started in St Margaret's and then spread to several schools. "The message behind the chains is that love does conquer hate and the youth in New Zealand and in Australia care about these issues, and we care about the affected communities from the events on Friday," Sujean told the Herald. She said Friday's shootings were a shock. "We're so well known for being a peaceful city and a peaceful country. I couldn't really grasp my head around it being a reality in New Zealand." But she said so many people coming together to support the vigil helped to process what had happened – especially as it was an event initiated by young people. 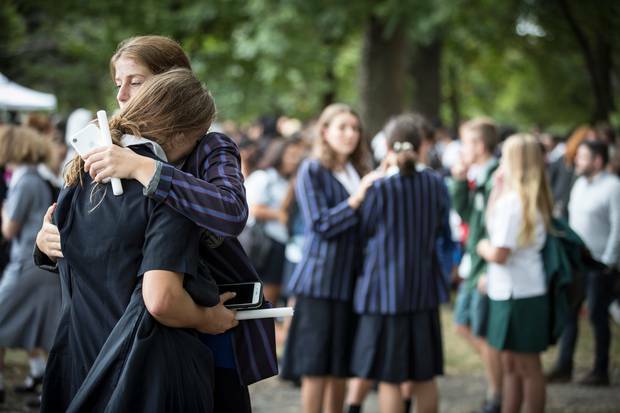 "The majority of the schools from Christchurch are in attendance today." During the vigil, Tilaia lit a candle in the centre of the congregation and quoted Martin Luther King: "Darkness cannotdrive out darkness; only light can do that. Hate cannot drive out hate; only love can do that." Students became emotional during a waiata, He Honore, which was sung after more candles were lit and passed around to light even more candles. As students then made their way to the memorial site on Deans Ave, groups broke out in haka and waiata. Cashmere High Year 10 student, Sayyad Milne and year 12 student Hamza Mustafa were killed on Friday. Cashmere Principal Mark Wilson has described Sayyad as "an awesome kid … with kind eyes, a big heart, a cheeky smile and a thick mop of black hair". "He was studying hard and was planning to be an engineer or an architect." Wilson said Hamza came to New Zealand after he and his family fled the civil war in Syria. "He was an excellent horse rider and had ridden in equestrian events back in his home countries. He aspired to be a veterinarian, which reflects his love of animals … He was a great student … and a compassionate young man." Hamza's younger brother was also in the mosque and suffered gunshot wounds to his leg. Adding to the family's trauma, their father was also killed. Former student Tariq Omar, 24, also died in the shooting. Wilson said a father of a Cashmere student had also been killed, and another father of a student had been injured. Students and staff at the school, which has over 2000 students, were being supported. Speaking to media after the vigil, Tilaia said he was not focusing on what happened on Friday. "That's what he wanted, the attention. We're not going to give him the attention. "We're going to focus on us as a community coming together as one for love and peace, not hatred. That's not what Cantabrians are about. We're so resilient. "And it's probably made us stronger as a community and as a city." He said the vigil showed that the youth have a voice. "And a positive one. This is a student-led initiative uniting as students for love and peace. "We're not going to go around posting hatred on social media. We're not going to be pointing fingers or blaming others. "We're going to focus on making sure those families are alright, making sure those hardworking police officers and doctors are alright."